We left Oregon 7th November and plan to return 3rd October. I have spent the last month planning our stops and have thus far booked our campgrounds thru St Ignace MI. It is a tedious project especially since we are going to areas for the first time. Our friends we met several years ago, Verna and Trevor, have given us recommendations for New Brunswick and Nova Scotia. So after much research below is a list taking us thru the 3 September. Will do the remaining before going into Canada. Know you won't be too interesting in the list. It is mostly for reference. When we leave Mayport on the 7th we head to Shaw AFB in Sumter SC for 3 nights. 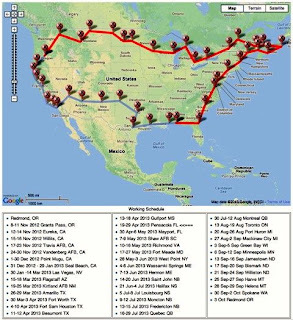 Our continuing trip will take us thru Green Bay,Minneapolis,Jamestown ND,Bismarck ND,Williston ND, Havre MT,Helena MT,Spokane and finally Redmond. This route may change. Our stay in Mayport is a week of rain, wind and rain.